Not that I’m the first one to think of this, but I think anyone who appreciates my work will agree I have a unique style and see the world a little differently than anyone else. And (hopefully) if you give the same assignment to 6 different photographers, you will get 6 different interpretations. Therefore, as part of my continuing exploration of the Lone Star State, a coffee table book on Texas Courthouses is in the works. As with any other project, this requires some planning. First of all, you need to appreciate the scope of the project. In some cases there are actually more than one courthouse per county. #4 is a very controversial topic and time-sensitive given the current socio-political climate. At a certain point in time, the county seat had to have the same name as the county. This resulting in renaming some cities. So last week I sat down and accomplished the laborious task of filling out a spreadsheet with every county and county seat – and whether we had been there – and whether I had captured the associated courthouse (the “duh” column. This was the critical sanity check. The “DUH” column had far too many entries. There are actually 43 cities we have been to where I did NOT capture the courthouse. FORTY-THREE. See, if you actually KNOW which cities are the county seats, you don’t have this problem. That’s why I did the spreadsheet. Not including these 43 cities, I have currently captured only 25 courthouses. Some of these omissions are circumstantial. 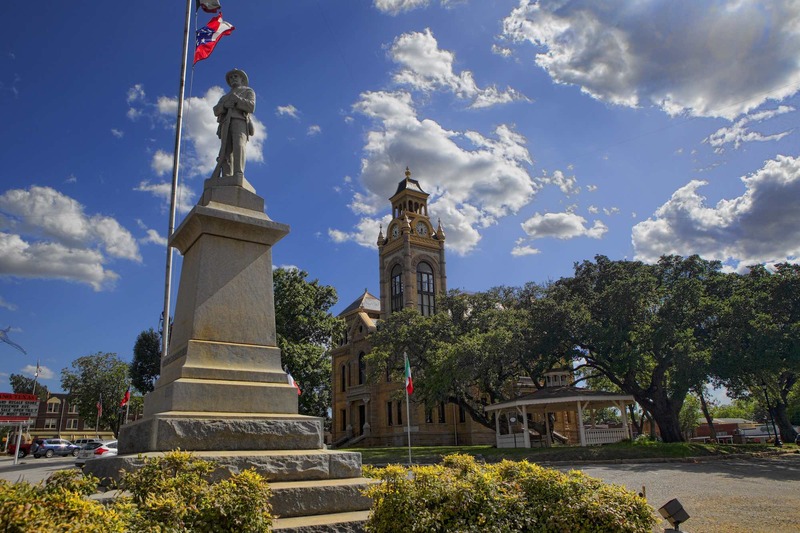 Like San Saba, where we stopped a couple of weeks ago and the courthouse was under renovation and obscured by scaffolding. Another factor is time of year. Texas courthouses are best viewed in the Winter. Why? Trees. Massive trees. Trees in Spring and Summer obscure the architecture with millions of LEAVES. <sigh> So Winter is when you want to see them. So now that I know what I don’t have, it’s time for a LOT of road trips. Our Facebook Page has a courthouse gallery if you would like to see what I have so far. In Texas As I See It, the Denton courthouse is captured in Winter – in all its glory. In Volume II you will see it in Christmastime at night, festooned in light. This perfectly illustrates the TREES issue.